You have been chosen to lead an elite crew of Pod pilots who will delve below the surface of Mars in Solarus Corporation's first major drilling expedition. As a part of this maiden voyage, the corporation has agreed to let you reinvest any profit you earn back into training your Pod pilots, increasing their skills and efficiencies. Will you be remembered as the greatest Solarus Corporation employee in the galaxy? 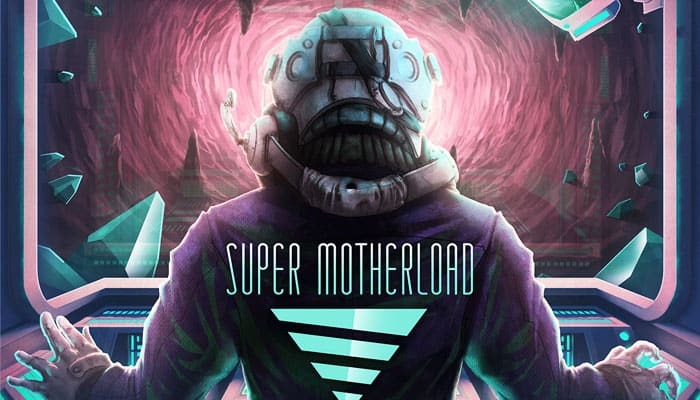 Super Motherload is a deck-building game. This means that you have your own deck of cards that you draw from each turn. Your deck initially consists of very basic cards, but over the course of the game you will add new and more powerful cards to it. 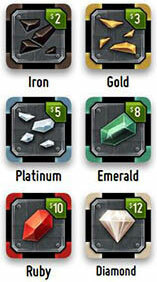 You will use these cards to Bomb and Drill minerals, and other bonuses, from the game board. You then use the minerals you've collected as money to purchase better cards for your deck. Some cards give you an immediate bonus when purchased, while others give you bonuses when you use them to Drill. Every card you purchase is worth Victory Points (VPs). 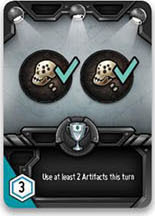 You can also gain VPs from Achievement Cards that become available throughout the game. The player with the most VPs at the end of the game wins. Place the "Depth 1" Game Board in the center of the table. The player to the right of the starting player chooses which side will be face up. Place the Mineral Tiles close to the board. Mix up the Artifact Tiles and place them face down close to the board. Shuffle the deck of 10 Major Achievement cards and deal 3 of them face up close to the board. Place the remaining 7 Major Achievement cards back in the game box. Shuffle the deck of 20 Minor Achievement cards and place them face down in a pile near the board. 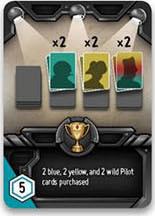 Deal 4 of them face up below the row of Major Achievement cards if you are playing a 2 player game. Deal 3 of them face up if you are playing a 3 or 4 player game. Place the Tunnel Tiles close to the board. Place the Bomb Tokens in a pile close to the board. Place the rest of the Game Boards in a pile somewhere accessible from the game area. Each player selects one of the 4 available Player Decks and sets up their Player Area. The 4 Player Decks are differentiated by the color of the mining vehicle featured on the card back (purple, green, orange, and grey deck). 1 Remove and shuffle your 7 Starting Pilot Cards (The cards from your Player Deck that don't have a cost in the top right corner) and place them face down in a stack in front of you to off the side. This stack represents your starting Draw Deck. 2 When positioning your Draw Deck, it is a good idea to leave space on the left or right for what will soon become your Discard Area. 3 Take a Bomb Token from the supply and place it in your Player Area. 4 Divide your remaining 16 Pilot Cards into four stacks according to the color of the Drill Icons on the cards (order shown below: red, blue, yellow, and wild). Order the cards within each stack in ascending order according to the green cost located in the top right corner of the card ($10 on top, $25 on the bottom). Place these stacks in a row along the top of your Player Area. 5 Draw 4 cards from your Draw Deck into your hand. Draw 2 cards from your Draw Deck into your hand. 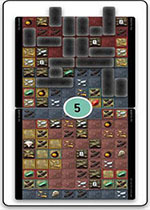 Use matching Drill Icons to Collect Mineral Tiles and bonuses from the board. 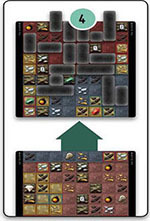 Use a Bomb Pattern and Bomb Token to Collect Mineral Tiles and bonuses from the board. Important: You may choose to perform the same action more than once in a turn. If you have more than 5 cards in hand at the end of your turn, you must place cards from your hand into your Discard Area until you have only 5 remaining in your hand. When you perform a Draw Action, draw 2 cards from your Draw Deck and add them to your hand. If at any time during the game you need to draw a card and there are no cards left in your Draw Deck, gather the cards in your your Discard Area and shuffle them to create a new Draw Deck. Important: Only shuffle the cards in your Discard Area when you need to draw and your Draw Deck is empty. For example: if you need to draw 2 cards, and there are 2 cards left in your deck, do not shuffle. Place any number of cards featuring Drill Icons of a matching color from your hand into your Discard Area. Multicolored Drill Icons are considered "Wild" and may be combined with Red, Yellow or Blue Drill Icons to represent that color. If only multicolored Drill Icons are played, they must all represent a single color of your choosing. Take Tunnel Tiles from the supply with total length equal to the number of Drill Icons you played. Place them in a straight line on the Game Board. Collect minerals and bonuses from all spaces you cover with Tunnel Tiles. Spend a Bomb Token ( ), returning it to the supply. You cannot perform this action if you have no Bomb Tokens. 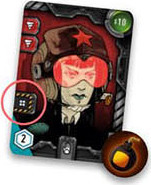 Place a Red Pilot Card featuring a Bomb Pattern on the left side from your hand into your Discard Area. Take Tunnel Tiles from the supply and place them in the exact shape depicted on the Bomb Pattern shown on the discarded card. You may flip and rotate the Bomb Pattern as you wish. 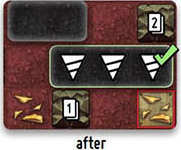 1Tunnel Tiles must connect to Tunnel Tiles already on the Game Board or the "surface" line of the "Depth 1" board. 2Tunnel Tiles are connected edge-to-edge, and not corner-to-corner. 3Tunnel Tiles can be connected along multiple edges to Tunnel Tiles already on the Game Board. 4 The connection can be made along any edge of any space of the Tunnel Tiles you are placing (eg: you can always connect a new three-length Tunnel Tile along the edge of its middle space). 5Tunnel Tiles can "progress" in any direction (i.e. you can Drill / Bomb up towards the surface). 6Tunnel Tiles may not be played so that they hang off the edge of a Game Board, but they may be played across the "seam" of two connected Game Boards (more on adding Game Boards later). 7You may combine multiple Tunnel Tiles to create any shape needed (e.g. a two-length and a three-length Tunnel Tile can be used as a five-length one). 8 Tunnel Tiles may not overlap each other. 9 No player retains "ownership" of a Tunnel Tile after it is placed. You may connect a new Tunnel Tile to any one already placed on the Game Board. 10Tunnel Tiles may not be moved or removed from the Game Board after they are placed. 11 When Drilling: Tunnel Tiles must be placed in a continuous straight line. This line cannot change direction. 12 When Drilling: You cannot omit spaces from a Drilled Tunnel. The total length of all Tunnel Tiles placed must be equal to the number of Drill Icons on the cards played. 13 When Bombing: You cannot omit spaces from a Bomb Pattern. 14 When Bombing: The shape of the placed Tunnel Tiles must match the Bomb Pattern depicted on the card played. You can flip and rotate the bomb pattern as you wish. All spaces on the game board feature one of three types of terrain. Each terrain type has its own set of restrictions on the placement of Tunnel Tiles. No special rules: Dirt spaces can be Bombed or Drilled without restriction. All 4 colors of dirt are regarded as the same terrain type. Multiple colors of dirt can be Drilled or Bombed in a single action without restriction. Cannot be Bombed. To Drill a Steel Plate, the color of the Drill Icons played must match the color bordering the Steel Plate. Can be Bombed. Cannot be Drilled. 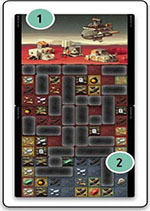 When you cover spaces on the Game Board with a Tunnel Tile using a Drill Action or a Bomb Action, you may immediately Collect from those spaces. Take all the corresponding Mineral Tiles from the supply and place them all onto the topmost Pilot Card of one of your four Pilot Stacks. Mineral Tiles are worth money equal to the number in the top right corner and are used to buy new Pilot Cards. Important: All Mineral Tiles Collected with a single Drill or Bomb Action must be placed on the same Pilot Card (you may not split them up). Take a Bomb Token from the supply and place it in your Player Area. Take any face down Artifact Tile from the supply and place it in your Player Area. Unlike Mineral Tiles, Artifacts Tiles are not placed on a Pilot Stack. They may be stored face down and kept secret from other players. Immediately draw the number of cards dictated by the icon from your Draw Deck. If at any point, the total money value of the Mineral Tiles on the topmost card on one of your four Pilot Stacks either meets or exceeds the card's cost (shown in the top right corner of the card), you Buy that card by returning all of the Mineral Tiles on it to the supply and placing the card into your Discard Area. This happens immediately after your current action. You do not receive "change" when you spend more than the cost of the card (any excess is lost). When you purchase a card that features a Buy Bonus Icon along the bottom edge, you also receive a Buy Bonus. These bonuses do not require an action to receive, and happen immediately after you take the card. You only receive this bonus when the card is purchased. 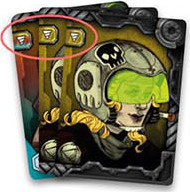 Some cards feature Drill Bonus Icons. These icons give you an instant bonus whenever the card featuring it is used as part of a Drill Action. You receive these bonuses in addition to adding the card's Drill Icons to the Drill Action. If you discard multiple Drill Bonus Icons in a single Drill Action, you receive all the Drill Bonuses. Artifact Tiles are special tiles collected from the board that can be discarded at any time during your turn (using them is not considered an Action) to gain the Artifact Bonus shown on the back of the Artifact Tile. There is no limit to how many Artifact Tiles you can store in your play area. There is no limit to how many Artifact Tiles you can spend in a single turn. Important: When discarding an Artifact Tile, return it to the central supply face up. Discarded Artifact Tiles are considered to be removed from the game and may not be taken again. Achievements instantly reward you with VPs for doing awesome stuff. There are 2 types of Achievement cards: Major and Minor. If at any point during your turn, you fulfill the goal shown on an Achievement card that is in play, you may immediately take the Achievement card and place it face down in your Player Area. Major Achievements reward you for having purchased the set of Pilot Cards shown from their corresponding Pilot Stacks (each Pilot Stack contains 4 cards). If you purchase more Pilot Cards of a specific color than the Major Achievement requires, you may still claim it. Major Achievements are not replenished after they are claimed. Minor Achievements all have specific goals written on the cards. Whenever a player claims a Minor Achievement card, immediately draw a new one from the Minor Achievement deck to replace it. (If the last Minor Achievement is taken by a player, no further Minor Achievements will be available for the remainder of the game). You may claim a maximum of 1 Major and 1 Minor Achievement card in a turn. Some Minor Achievements require you Collect a specific Mineral Tile "across all cards". If the Mineral Tiles Collected during your current action allow you to fulfill this Achievement and also triggers a Pilot Card Buy, you may still claim the Achievement. You start a game of Super Motherload with the "Depth 1" Game Board on the table. As the game progresses, you will add new Game Boards and eventually remove old ones from play. 1 All Game Boards are marked with a number in the upper corners indicating the board's Depth. 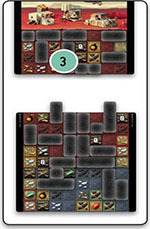 2 When you cover the last Artifact space on the current Game Board with a Tunnel Tile, take a new Game Board from the supply with a Depth value that is 1 greater than the Depth value on the current board. 3 If there are already two Game Boards on the table, remove the top-most board (the one with the lowest Depth value). Dump all the Tunnel Tiles from the removed board back into the supply. 4 Removing a board may result in Tunnel Tiles 'hanging' off the edge of the remaining board; these remain in play. 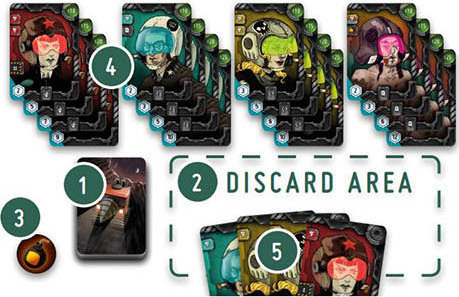 5 If you are the player who covered the last Artifact space, choose what side of the new board you would like to play with and attach it below the current Game Board. The new Game Board must be oriented in the same direction as the previous boards. Notes: Adding a board does not end a player's turn. In a 2 player game, only use depths 1,2, and 4. Depth 3 is not used. 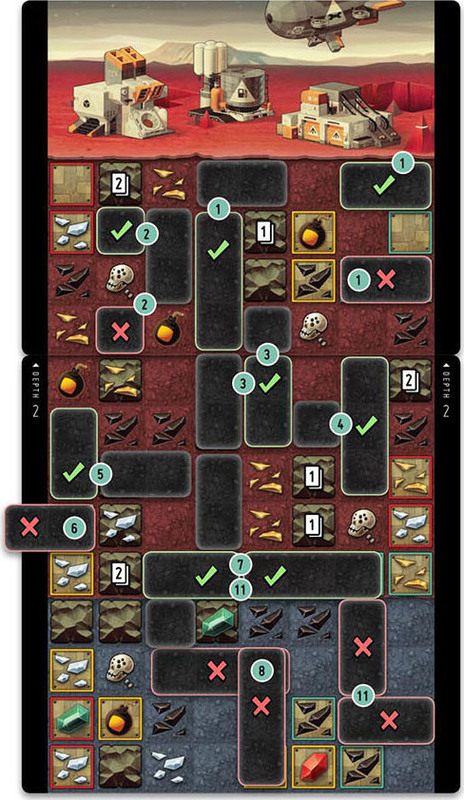 When a player Drills or Bombs the last Artifact on the "Depth 4" Game Board, the game ends immediately after that player's turn. Count up all the Victory Points (the numbers inside the white hexagons) shown on all of the Pilot Cards in your Draw Deck and Discard Area, any Achievement cards you have claimed, and any Artifacts you have collected featuring VPs. The player with the most VPs is declared the winner. In case of a tie, the player who lied about digging a hole to become the start player loses.